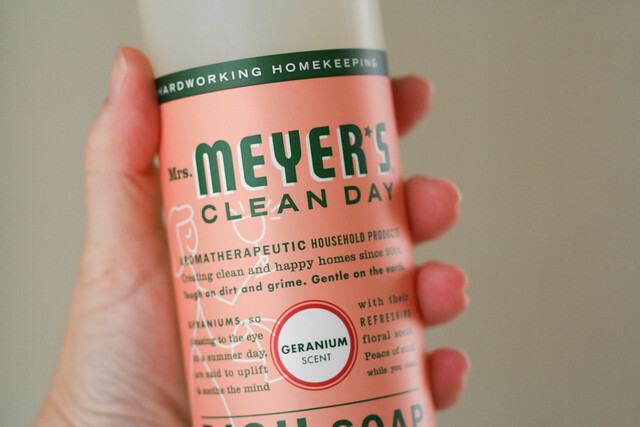 Mrs. Meyer's products are some of my new favorite things, and this scent is perfect for spring. I hadn't tried this one before ordering it, and to be honest I chose it purely based on the pretty color combo that I figured would look rather nice in any kitchen. (I'm a sucker for good packaging—no lie.) But I'm glad I also ordered a hand soap in this scent for myself because: mmmmm. It's fantastic. Due to the madness of shipping costs right now (seriously, what gives, USPS?!) this giveaway is for US residents only. To enter, simply leave a comment on this post! You can comment with anything. Your favorite Mrs. Meyer's scent. Your current guilty pleasure. Your shoe size. A random Friends reference. Anything your little heart desires. Just be sure to leave a comment before Monday the 9th! 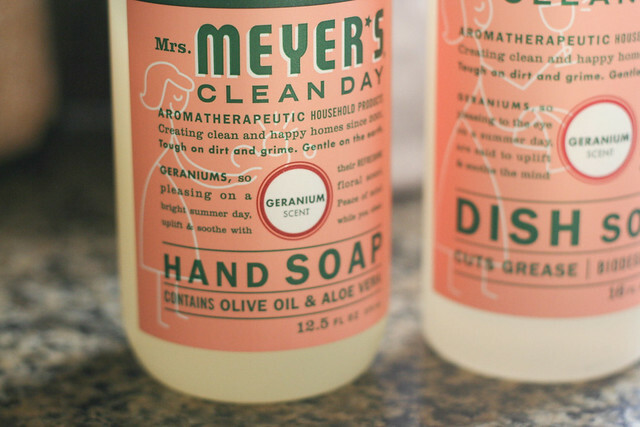 I will choose a winner next week, and they'll received one Mrs. Meyer's hand soap and one dish soap. Good luck, lovelies! And thank you again for supporting this blog. Affiliate links included in this post. If you decide to join ePantry via this post, you will receive $10 towards your order and I will receive a $10 credit on my own ePantry account. Thank you for your support! View my disclosure policy here. I love their Evergreen smell in the wintertime. It might be a holiday smell. I usually buy the hand soap, not the dish soap, but maybe I'll make that my next purchase! Mrs. Meyers pretty much rocks everything. Thanks for the generosity! I don't think I've ever actually used Mrs. Meyers before but I'd be game to give it a try. I love Mrs. Meyers - clean day or lavender. I also love the containers so much that I'll refill them with other soap. Lovely! Oh youre the sweetest for sharing this giveaway with us! Definitely intrigued by the ePantry system... And you're right the packaging alone is so lovely! Would love to try! I've been using ePantry, but their app is not the best. It's difficult to compare prices because they're just not listed until you add them to your cart. That said, I love the ePantry candles! I've been wanting to try that scent! I don't think I even know what geranium smells like. I love Meyers products! My fav scent is the cranberry limited edition during the holidays! So happy it's Friday (and sunny here)! Could this BE any more awesome if a giveaway?! Said like Chandler Bing! "I have tasted my own medicine, and it is bitter!" Greetings from (I wish) Mama's Little Bakery - Chicago, IL. I will buy anything that has great packaging, so I can totally relate. My current guilty pleasure you ask? Florida Georgia Lines album (can't wait for a new one this summer! ), pricy candles from Marshall's (they have my favorite scents: Wild Honey Nectar and Warm Tobacco Pipe), and Target dollar bins (a dolla will make me holla!). Oh man, this one might be my favorite scent. Although... have you tried Honeysuckle? Also fab. :) Thanks for hosting this giveaway! i just found out I'm pregnant with baby #1!! 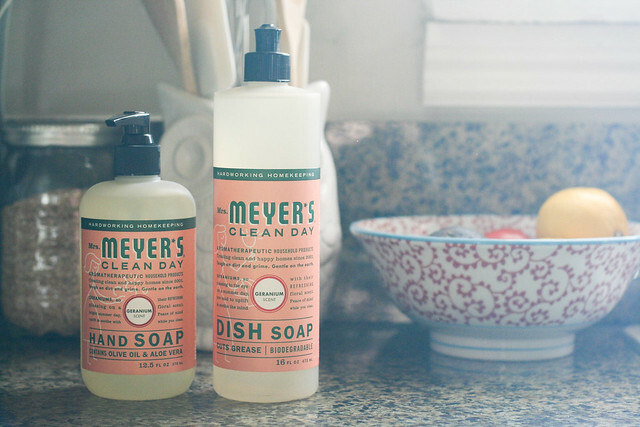 I've heard very good things about Mrs. Meyer's products, but haven't had the chance to try them yet. Would love to win so I could have the chance. I've been rewatching Friends on Netflix and since I have had two kids since last time I watched, I find Rachel's birth scene with Emma hilarious. My favorite scent is Honeysuckle. Thank you so much for offering such a wonderful giveaway. Hmmmm...this might be a double comment because my first one isn't showing up? I've been wanting to try that Geranium scent, glad to hear you like it! Love love Mrs Meyers! I love parsley and radish scents lately. The radish scent surprised me! It is lovely! These sound great! Thanks for sharing with the giveaway! I have never tried Mrs. Meyer's, but I would like to! I'm with you, I love pretty packaging. I would love to try these products. I love the smell of lemon soap in the kitchen, so refreshing and clean smelling! I am moving soon and what better to complement my new place than some new cleaning supplies! Thank you for the opportunity to smell and enjoy these products with you as well. I love anything citrus so their lemon verbena is my fav! great products, thanks for the giveaway! I would love to try this. Thanks for a great giveaway! I love their products! Lemon verbana is amazing! My favorite is Lemon Verbena. I think my house feels cleaner when it smells like lemon. The geranium scent smells nice!